I think I've finally gotten myself together enough to share a few photos from our trip with you. Things around here have been a bit hectic since we got back but I'm working on getting back to my regular routine. In fact, I scored a bunch of late 40s-early 50s cotton dresses at a flea market over the weekend that I spent all day yesterday soaking and drying in the sun (but that's another story). 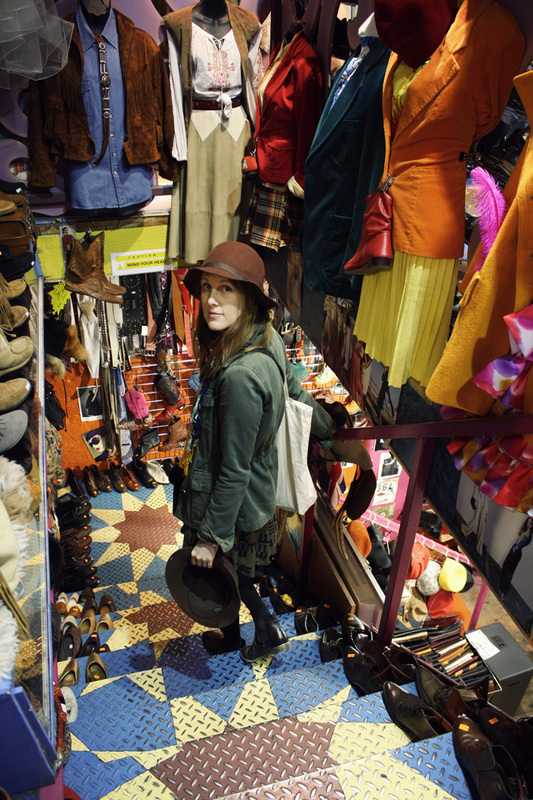 This story involves shopping at The Stables Market in Camden and a hat that I found at a vintage shop that hardly left my noggin' for the remainder of our trip. Our time in London was based in Camden Town, in walking distance to the Stables Market. 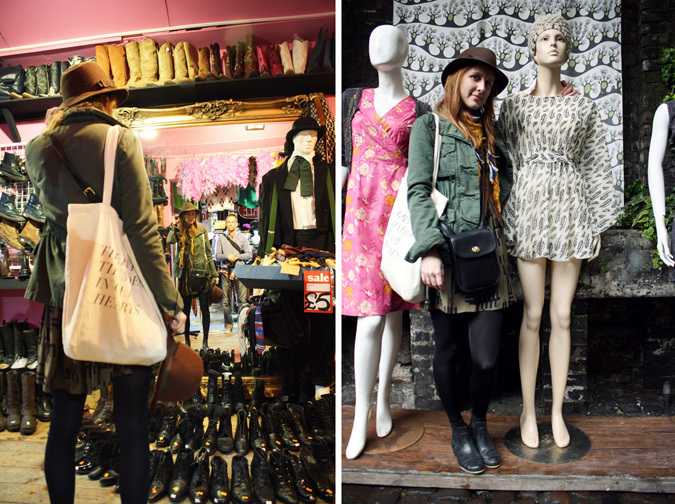 The first day we were there, we wandered into a vintage shop and spent some time sifting through the racks. Honestly I didn't find much that piqued my interest but I did spot a vintage felt fedora in the exact shape and size I'd been hunting for. I bought it despite the fact that it closely resembled the thrifted J.Crew felt hat that I'd brought with me. I could sense Tom's confusion as to why I was buying a hat that pretty much looked exactly like the one I was already wearing. But they are different! Subtly so, but different nonetheless. I also bought that feather-printed-cape-dress at another shop. I haven't had a chance to wear it yet, so I thought I'd just show it to you on that super tall mannequin. As you can clearly see, the hat was my constant companion throughout our trip. I wore it while goofing around in the Stables Market, walking along the locks, riding the tube, visiting Big Ben, shopping at Les Puces de Saint-Ouen and wandering along the canals in Amsterdam. this seems like such a neat place! beautiful photos! Love your hat, what a great piece to have. I adore camden! It's like another world... Vintage shops and street food... My idea of paradise! this looks like such a dreamy place! maybe one day I will get to go! you look beautiful! and I've also been the recipient of the same confused looks from my boyfriend when buying items similar to what i already own. he usually asks "don't you already have one like that?" That vintage store in Camden was packed! Thanks for sharing!! I love,love,flea markets.This one looks awesome! !The flea market I want to go to is at the Rose Bowl...or somewhere in and around Pasadena,California. I was in London when I was 17, and would love to go back! beautiful, have a lot fun?? Reading this story was so enjoyable, Jennifer. It's funny how sometimes instead of being "us thrifting things", it's actually more like "things finding us". Looking at these pictures, looking at your peaceful expression, the feel is really that the fedora hat has found its home - I know it's just photographs and what I just wrote may sound completely silly, but I still find it very sweet.